(MENAFN - DailyFX) CRUDE OIL TALKING POINTS President Trump stated the price of oil is getting too high in his latest market-moving tweet calling on OPEC to increase supply after recent production cuts Crude oil has risen roughly 30 percent so far this year with prices now flirting with the $60/bbl area its highest level since November 2018 Read up on the Differences Between WTI Crude and Brent Oil or learn more about How to Trade Crude Oil President Trump tweeted this morning that it's 'very important that OPEC increase the flow of Oil which sent crude prices tumbling lower. Trump's remarks were not the first time he's voiced his opinion that oil prices are too high. CRUDE OIL PRICE CHART: DAILY TIME FRAME (JUNE 01, 2018 TO MARCH 28, 2019) Check out these Crude Oil Facts every trader should know! OPEC agreed to cut its supply of oil after prices collapsed through the fourth quarter of 2018 in response to shrinking demand for the commodity amid slowing global growth. Crude oil prices have since surged over 40 percent to $60/bbl after bottoming around $42/bbl in December. Although, risks of a slowing global economy remains a burden which is reflected by the latest downward revisions to GDP growth forecasts and plummeting sovereign yields. On that point, President Trump also stated that ‘world markets are fragile' in his tweet. The President of the United States has a history of chiming in on market performance, especially when it comes to stocks and the Dow Jones Industrial Average . As such, it appears that POTUS is looking to jawbone growth-favorable turns attemping to boost the equity index higher with positive US-China trade war news or alternatively talk down high oil prices which can increase costs across the economy as is the case today. That being said, OPEC likely will disregard Trump's comments with the oil cartel independently deciding their production plans. OPEC was supposed to convene to discuss oil output in April, but have since canceled the meeting as the group and its allies remain in agreement to hold production cuts at 1.2 million barrels per day. However, Russia's Gazprom Neft, one of the important non-OPEC oil producing stalwarts, stated it does not expect to continue the previously agreed upon supply cuts through the end of 2019. 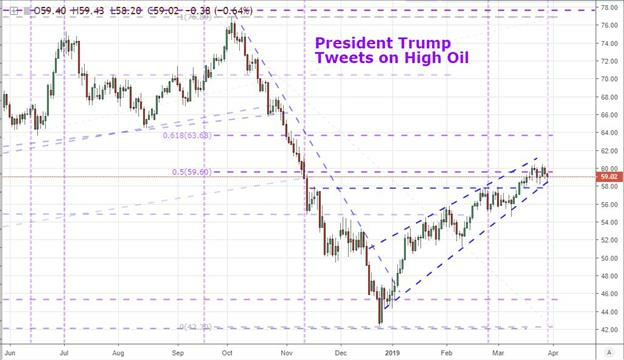 This news could be adding further downward pressure on oil prices today thus exacerbating the move lower in Crude following Trump's tweet. But, prices look to remain steady above $58/bbl as OPEC output decisions vastly outweigh non-OPEC members in terms of relative impact on the global supply of oil. CRUDE OIL TRADER CLIENT SENTIMENT Check out IG's Client Sentiment here for more detail on the bullish and bearish biases of EURUSD , GBPUSD , USDJPY , Gold , Bitcoin and S & P500 . According to IG client positioning data, 49.1 percent of traders are net-long with the ratio of traders short to long at -1.04 to 1 with crude oil traders appearing like they are growing increasingly bearish considering the number of traders net-long falling 3.3 percent compared to last week.